I look forward to Christmas every year. Christmas brings back so many memories, especially that time when life was good and Daddy was still with us. 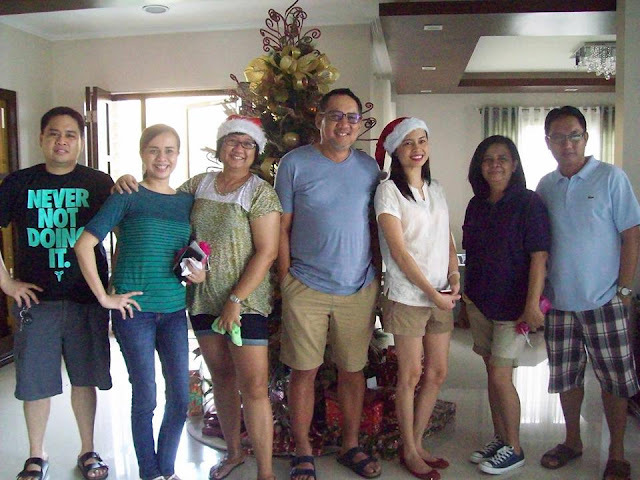 The shopping, the gazillion gifts, the sumptuous Christmas Eve dinner. It was such a happy time! However, Daddy succumbed to cancer in 1992 and we found it difficult to celebrate Christmas without him. It has been 23 Christmases. Twenty three long years without a father to celebrate it with. He may not be with us physically, but in our hearts, he is with us. We have been lucky to have a support group that showed us how to accept our loss. My aunts and cousins were always there to put a smile on our faces, especially during the first five years after Daddy passed. They were such a blessing! We have promised to spend all our Christmases together and that has been our family tradition ever since. 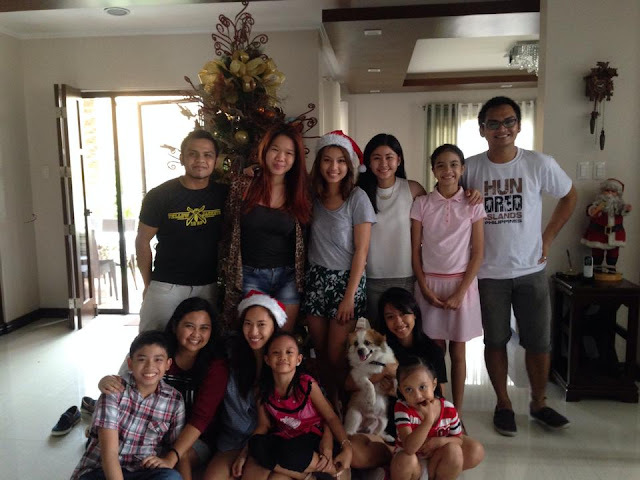 It is so fun to spend Christmas with my cousins and to see how big our kids have grown. We may only see each other once or twice a year, but we constantly keep in touch through phone calls, texts and updates on social media! Almost everyday, me and my best friend-cousin would message each other and talk about anything or everything, from politics to showbiz gossip. My children, nephew and nieces. It is so nice to see them all together! This Christmas will be extra special because we will be welcoming a new addition to the family. My daughter is due to give birth to her first born child. She's having boy and she and her husband will name their child Alfonso Miguel. I am so excited to see my very first grandchild! As of this date, there is only 54 days left till Christmas and I have kept myself busy by preparing a list of gifts to get for these people I hold near and dear to my heart. 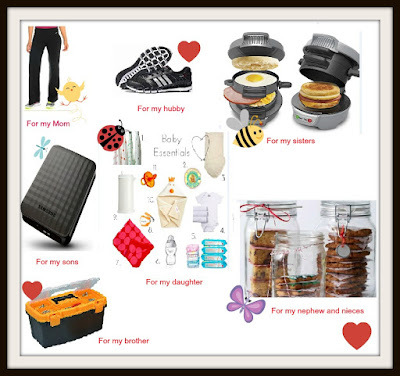 It is a difficult task to tackle because I want to find that perfect, special gift for each member of the family. Something they love, something they'd treasure, something that would remind them of me. I am not ashamed to say that among my siblings and my cousins, I am the only one who lives from paycheck to paycheck. This is the reason why I start saving early in the year, so that I may have enough spending cash for Christmas. I have had my heart and mind set for a major purchase for myself this year and I hope I get to have my wish granted. This is where my Christmas wish for myself comes in. I want to have my very own electric table top oven. I have found two different models at SM Department Store in Cubao and I found that they are quite affordable! 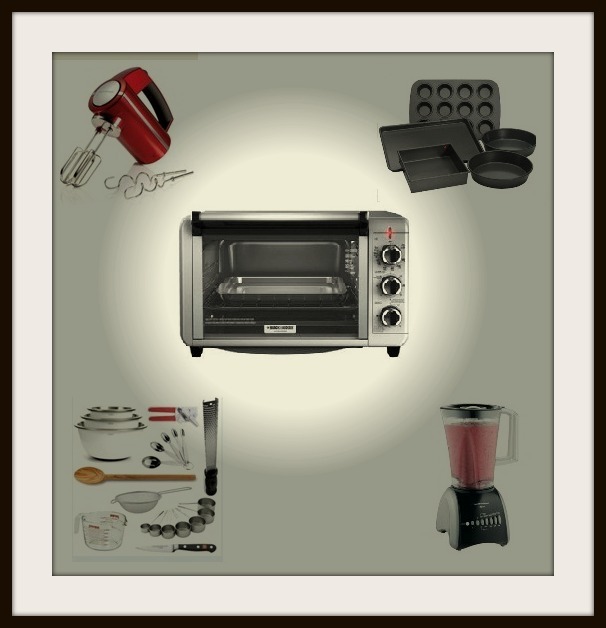 And if I'd do some serious baking, I would also wish for a mixer, a blender, pans, and other baking utensils. I have collected quite a number of recipes to try, however, I do have to have an oven first. That is at the top of my Christmas wish list for myself. I don't have to go to different places to complete my Christmas shopping list. 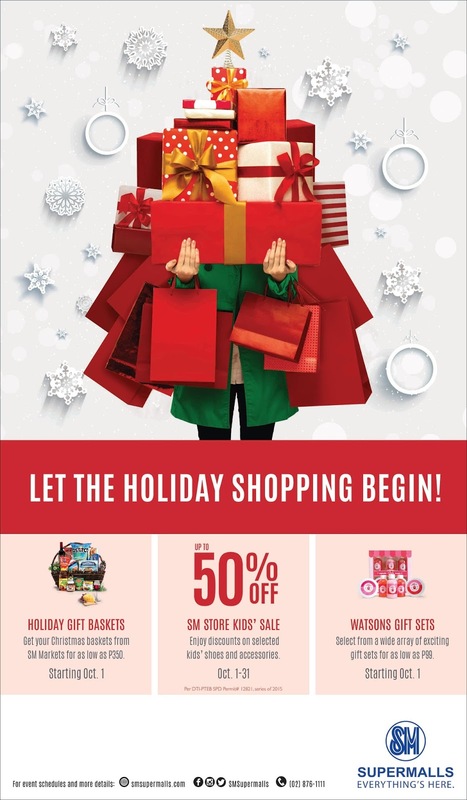 I know I will find what I need at SM Supermalls, and enjoy discounts too. It is going to be a Merry SM Christmas! My Christmas wish list for my family is as follows: For my mom, I'd like to give her a new outfit she can wear when she goes to her Senior Citizen Aerobics class, and a durable water bottle that she can take with her. For my husband, I'd like to give him a pair of shoes that is comfortable to wear when he goes in for his physical therapy sessions. For my sisters, I'd like to gift them with some kitchen gadgets. For my brother, I'd like to gift him with a new toolbox. For my daughter, I'd like to give her lots of baby essentials to help her and her husband prepare for the baby's arrival. For my sons, I'd love to give them computer peripherals like an external hard drive or new software for their desktop and laptop. Lastly, for my cousins, nieces and nephew, I'd give them my homemade sweets in large mason jars that they can re-purpose later on. Now that I have everyone covered, I must not forget to share my blessings with the less fortunate. My sons have a neighborhood friend whom they consider their "younger brother." This boy's name is Nemeth. His father passed away recently, and he does not know where his mother is. He stopped attending school and is now trying to earn his keep by being a parking boy near Savemore Supermarket P. Tuazon Blvd. He stays with his grandmother who is too old to work to pay for his education. My heart bleeds for Nemeth. I see him standing outside the supermarket waiting for some kind soul to dole out a few coins. If I only earn more than I need, I would help him finish his high school education. A high school diploma would at least guarantee him some kind of job later on in life. For now, all I can help him with is to buy him lunch whenever I see him. I'd also love to give him a new shirt, a pair of jeans and some decent shoes he can wear to Mass on Christmas Day. Then there are kids who do not know how it feels to have a family. The kids who, for most of their young lives, have spent their Christmases in the orphanage. These children are too young to understand why their lives turned out to be the way it is now. In our own little way, we can let them feel that there are people who care. Have you heard about the "SM Christmas Bears of Joy?" It is a wonderful campaign of SM Supermalls to bring joy and hope to the children this Christmas. 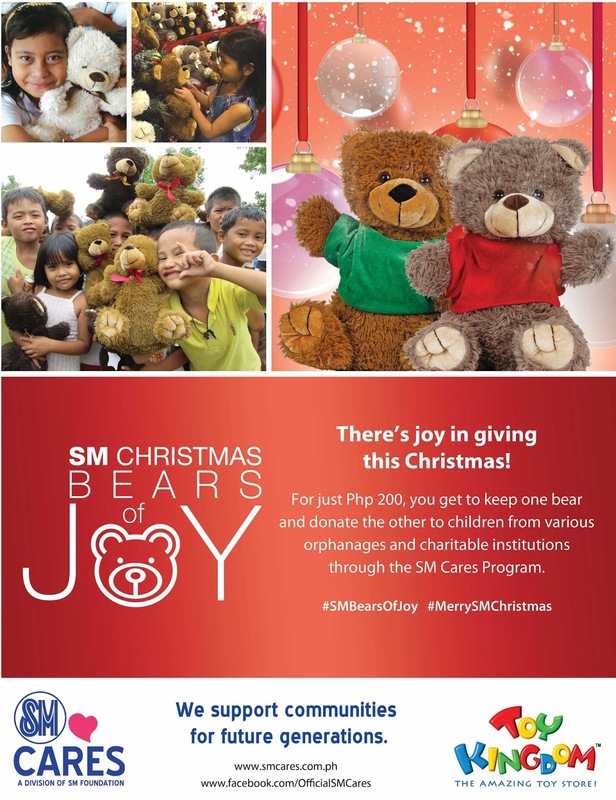 For a small amount of P200, we get to keep a cute teddy bear and donate another to a child in an orphanage or charitable institution through the SM Cares Program. If you remember the saying, "Everyone deserves a birthday cake." then for this Christmas season, I'd say, "Every child deserves a teddy bear." I am sure every one of us felt how comforting it is to hug a teddy bear. For a small amount, we can let a child know that there is someone, somewhere who loves them, cares for them and believes in their capabilities. I hope I'd be able to encourage you to participate in this campaign. Let's do our part to support and spread the love. Make a difference this Christmas. Don't forget to include SM Bears of Joy in your Christmas list. There is nothing more fulfilling than to share your blessings with those who have very little in life. Have a Merry SM Christmas everyone! I love Christmas as well. Over here in the US, I find Christmas too commercialized. It takes away the real sense of Christmas. I think more than gifts, the important part would be to spend Christmas with your family. It's nice to have gifts as a bonus, though. You're so thoughtful! You have such a wonderful family there, memories is always remember during this time of the year especially when you lost someone dear so much. What a great campaign. The teddy bears are really cute. I want to get two bears for my twin granddaughters. I'm sure SM will make a lot of children happy this Christmas. Every child does deserve a teddy bear! Terrific campaign! What a great campaign. The holidays can be a very hard time for a lot of people. I wish I had one of these malls near me--I would certainly buy a bear then tell them to send both to children who need them! Teddy bears are looking really really cute, impressed with the campaign! I haven't heard of the Christmas Bears campaign but it looks wonderful.